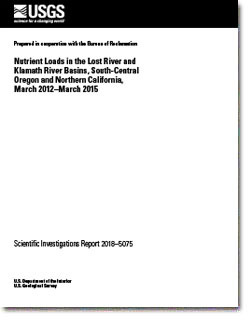 The USGS has computed a nutrient budget (including total phosphorus, total nitrogen, 5-day biochemical oxygen demand, and 5-day carboneceous biochemical oxygen demand) at specified sites within the Klamath Reclamation Project. This budget can also be used to better characterize water quality in the Lost River and Upper Klamath River Basin. The study was conducted over three years beginning in March 2012 and ending in March 2015, and utilized data collected by the Bureau of Reclamation and the USGS.